The Rutgers Psychology Child Development Center is comprised of 2 twelve-month Rutgers University preschools sponsored and operated by the Psychology Department. The Center provides education and childcare for children ages 1-5 years of age through 2 campus preschools and can trace its history back to 1930. A recent collaboration with the Culture of Health Academy within the Center for Childhood Nutrition Education and Research at the Institute for Food, Nutrition, and Health has led to a program expansion and the opening of a second site. Both sites are located on the Cook/Douglass campuses of Rutgers New Brunswick and provide beautiful, thoughtful, and spacious environments for young children to learn and develop. 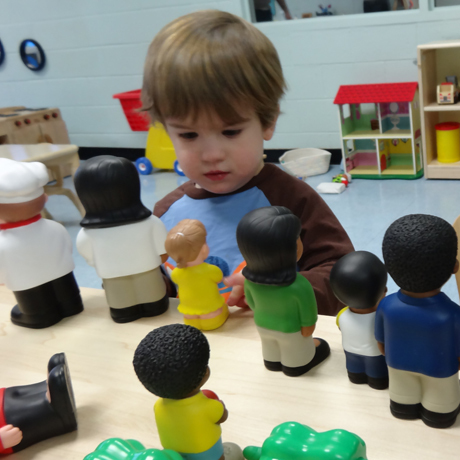 As the early childhood laboratory preschool for the Psychology Department, the Center supports research and academics at Rutgers University accessible to all departments and programs who are interested in conducting research and/or offering academic courses in early childhood-related fields. Our University affiliation allows us to offer programming for our children based upon the latest research and findings in the field, to employ highly qualified staff and motivated college student support staff, and to provide low adult-to-child ratios, ensuring children receive the time and attention they deserve. Our innovative and dynamic partnership with the Culture of Health Academy allows our Center to offer and participate in programs and research dedicated to promoting healthy lifestyles and creating nutrition education curricula for preschool children.